A plaque at Customs House commemorates the Centenary of Federation & the Centenary of Australian Customs from 1901 to 2001. 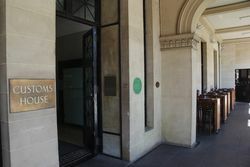 The Department of Trade and Customs was an Australian government department that existed between 1901 and 1956. It was one of the inaugural government departments of Australia established at federation. In 1956, the department was abolished and most of its functions were split between the Department of Customs and Excise and the Department of Trade. 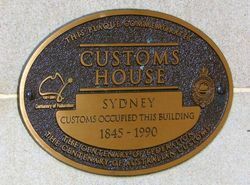 Customs occupied the building from 1845 to 1990.